We offer training via live, on-site programs and via webinars and other virtual programs to accommodate the needs of international audiences and teams in multiple locations. Our trainings are geared to the following audiences: Brand, and marketing managers, sustainability directors, product designers, legal staff and others looking to understand the strategies, tools, and frameworks for effective and credible green marketing and measurement. A highly interactive workshop designed to help forward-looking brand and marketing teams profitably address the sustainability needs of today's mainstream consumers. 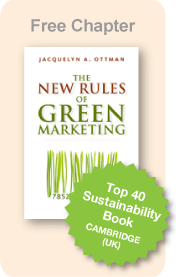 It is specifically developed to help attendees take key insights and practical strategies from Jacquie Ottman's award-winning book, "The New Rules of Green Marketing," from written word to profitable action. Practical in orientation, it equips attendees with strategies for product greening ("eco-design"), eco-innovation, communicating with credibility and impact, and partnering with stakeholders. It is illustrated with case examples from sustainability leaders worldwide. Link here to listen to a webinar Jacquie gave on this topic. Exciting new products and packages made from corn, sugar cane, soy and other biobased materials are fast coming to market in response to consumers' needs for natural, renewable and compostable alternatives to petroleum-based offerings. Many will likely earn the USDA's new Certified Biobased Label. As consultants to the USDA BioPreferred program we are uniquely qualified to help your team understand how best to position your biobased products and packages to consumers and commercial customers, develop credible claims that can be verified by a third party, and otherwise maximize the marketing opportunities associated with the USDA Certified Biobased label. All trainings are based on the strategies and examples included in Jacquie's book, "The New Rules of Green Marketing: Strategies, Tools and Inspiration for Sustainable Branding", now available in book stores and online globally. To learn more link here.